During the Ordovician Period, the surface of the earth was dramatically different than it is today. Nearly all life on earth was in the oceans. The only land life was in the form of very primitive plants very near the water line of the coasts, probably mosses and algae and were of a non-vascular nature. Insects did not yet exist, nor did amphibians or reptiles. Fish as we know them did not exist, although a form of primitive fish began to appear by the end of the Ordovician. Though Ordovician life sounds primitive by today's standards, the life during this period was more advanced than life in the earlier Cambrian Period. Ordovician life was characterized by a dramatic increase of the shelly fauna, corals, and bryozoans. The shelly fauna include the brachiopods which did exist prior to the Ordovician, but were less numerous and mostly inarticulated. 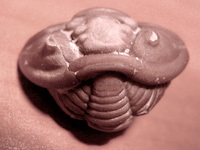 The Ordovician introduced numerous articulate brachiopods which have a tooth-and-socket arrangement along their hinge line. 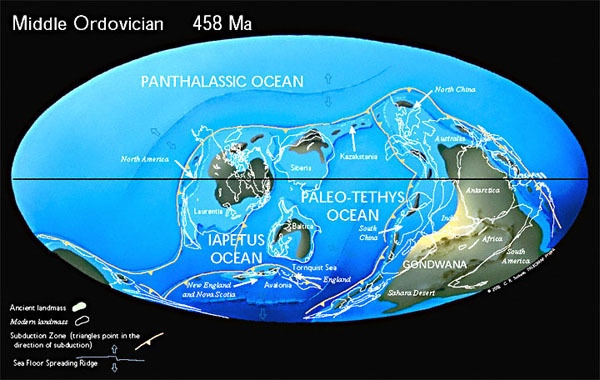 In order to understand how the environment of the Ordovician Period differed from today (the Quaternary Period), it is necessary to realize that continental drift has dramatically changed the face of the earth since the Ordovician Period. The following animation illustrates how much the earth has changed from the Late Precambrian Period (600 Million Years ago) through the Cretaceous Period (70 Million Years ago). In the case of what is today North America, only the newly forming Appalachian Mountains (resulting from a mountain building episode known as the Taconic Orogeny) and their surrounding environs were above sea level. Ohio, Indiana, Illinois, and Michigan were innundated by a shallow sea known as the Sauk Sea. This environment encouraged the development of corals, trilobites (primitive arthropods), gastropods (snails), bryozoans, cephalopds (similar to squid), and brachiopods (similar to clams and mussels). By the end of the Ordovician Period, primitive jawless fish called Ostracoderms appeared. These primitive fish were covered with bony plates and were among the first vertebrates on the earth. The following image shows how the earth looked approximately 450 Million Years ago, during the Late Ordovician Period. The brown areas show the location of the continents. Notice that many of today's continents were covered by shallow seas. The fossils found near Cincinnati and Southeastern Indiana are world renowned for their abundance and state of preservation. This was made possible by the conditions that existed in the area. In the Cincinnati area, shallow seas and life dominated the environment. To the East, active volcanic mountain highlands were being constantly eroded by the forces of nature. As the erosion progressed, the sediment was carried downlope into the shallow Sauk Sea to the West. This sediment buried many organisms under an airtight, muddy blanket which encouraged the remarkable preservation seen in the fossils that were left behind. The muddy blanket eventually turned into limestone which is found extensively in Indiana, Kentucky, and Ohio.